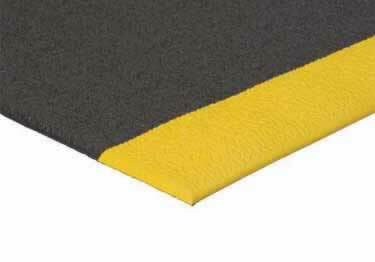 3/8" trimmed in OSHA yellow, Available 2 surfaces, embossed or pebble for increased safety On sale now, 10% off regular price. Starting at $22.55. 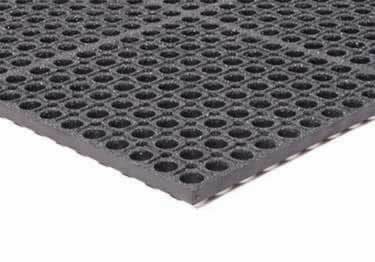 1/2" thick, grease-resistant or black symmetrical holes for drainage, while nibs on the mat bottom enhance drainage. On sale now, 10% off regular price. Starting at $69.63. 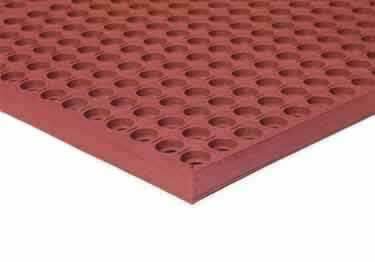 5/8" or 7/8" mats, rolls, or custom sizes. Available in 5 color combinations. Safe for welding and anti-static applications. Starting at $56.13. 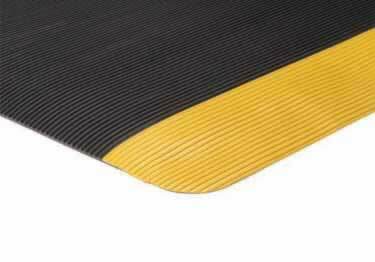 3/8" or 1/4" thick, choose from 2 surfaces, 2 colors & excellent anti- fatigue performance, available in mats & rolls. On sale now, 10% off regular price. Starting at $21.34. 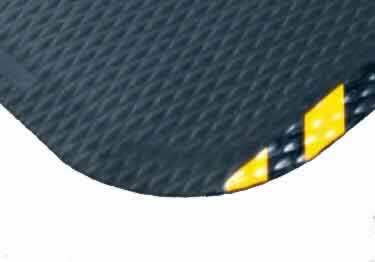 1/2" thick, available in black or black/yellow borders with an attractive tough diamond plate design. Available in mats or rolls. On sale now, 10% off regular price. Starting at $32.62. 7/8" thick, 3 colors & grease-proof with drainage. 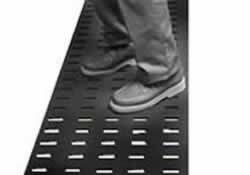 Available in optional safety grit surfaces & link together connectors. On sale now, 10% off regular price. Starting at $103.18. 1/2 thick, oil and grease proof, with air bubbles for comfort & stimulating blood flow & energizing the users legs and back. On sale now, 10% off regular price. Starting at $39.14. 7/8" thick with drainage & beveled edges. 4 colored borders & anti-slip grit surface. Available in link-together mats On sale now, 10% off regular price. Starting at $88.18. 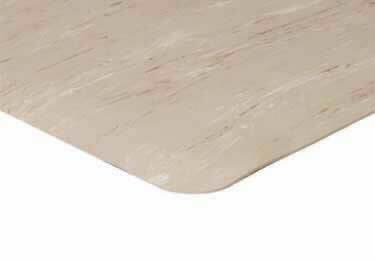 1/2" thick, available in 5 colors, providing a combination of comfort & an easy-to-clean marbleized rubber surface. On sale now, 10% off regular price. Starting at $39.23. 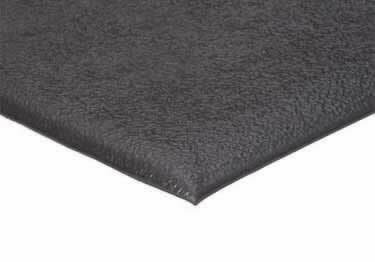 1/2" thick, dual density foam with an extra-tough surface layer, outlasts single layer mats. 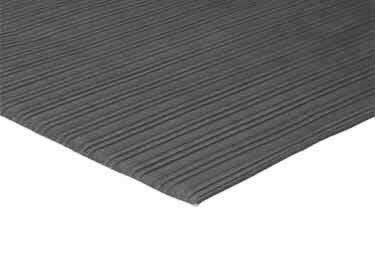 Available in mats or rolls. On sale now, 10% off regular price. Starting at $24.26. 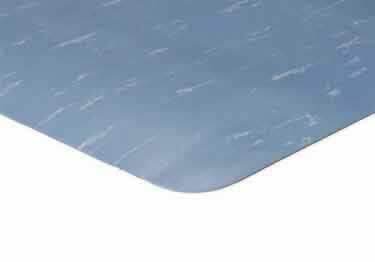 5/8" thick, featuring beveled edges and an embossed surface for additional safety. Available in mats and rolls. On sale now, 10% off regular price. Starting at $26.48. 11/16" thick closed cell foam, with a high-tech appearance & rugged, long-lasting 3/16" thick pyramid surface. On sale now, 10% off regular price. Starting at $62.04. 7/8" thick, available in 3 colors, mats&rolls, providing comfort and durability with an easy-to-clean anti-slip surface On sale now, 10% off regular price. Starting at $68.78. 9/16", 11/16" & 15/16" thick, 8 color combinations. 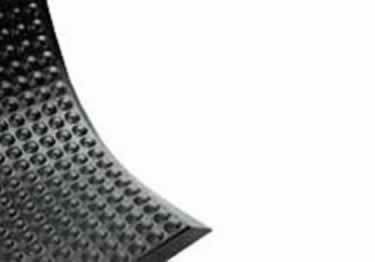 Diamond plate surface supported by ErgoFlex foam for extra comfort. On sale now, 10% off regular price. Starting at $50.88. 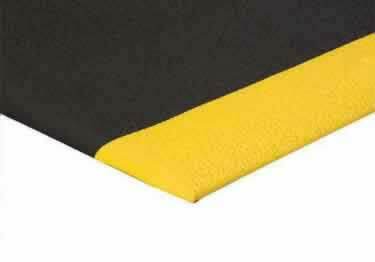 1/2" thick, 2 color combinations, with an aggressive surface texture & specially formulated foam & enhanced cell structure. On sale now, 10% off regular price. Starting at $31.87. 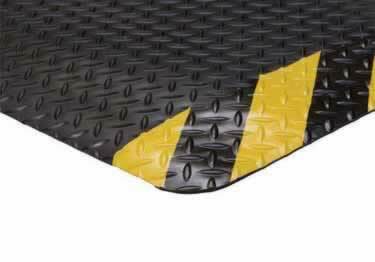 1/2 thick Black or Black/Yellow, fluted vinyl surface for greater traction, beveled edges allows for cart access. On sale now, 10% off regular price. Starting at $45.49. 1/2 thick, spark resistant for welding. 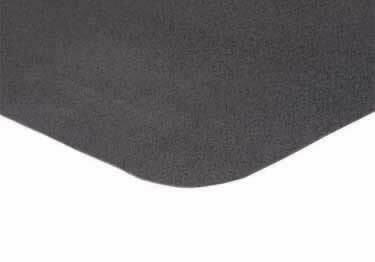 Available in Black slip-resistant surface. Comes in mats and rolls. On sale now, 10% off regular price. Starting at $68.16. 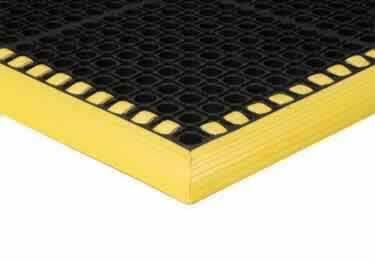 Polyurethane, anti-fatigue mat. For dry areas such as: warehouses, labs, retail, and airports. Starting at $151.41. 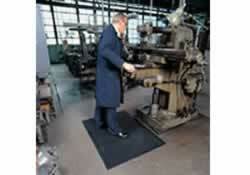 Anti-fatigue mat combines softness, resilience, and durability. Starting at $35.02. 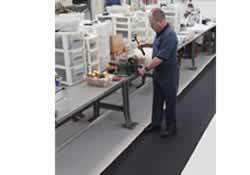 Rubber flooring, permanently bonded to heavy sponge rubber base. Interior use in banks, assembly lines, etc. Starting at $24.80. 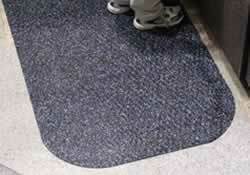 HogHeaven ConfettiTM is durable comfort with an environmentally friendly all rubber surface. Starting at $56.13. HogHeaven PlushTM is an Anti-Fatigue mat offering maximum comfort and striking appearance. Starting at $73.25. 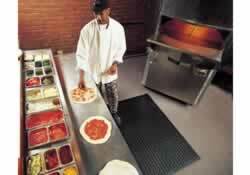 HogHeaven MarbleTM is an attractive and durable anti-fatigue mat for dry environments. Starting at $75.53. 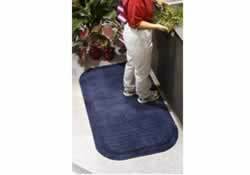 Excellent for both a heavy-duty anti-fatigue mat, as well as a scraper mat. Starting at $52.30. 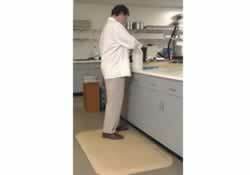 Provides excellent anti-fatigue properties for added employee comfort and improved ergonomics. Starting at $52.30. 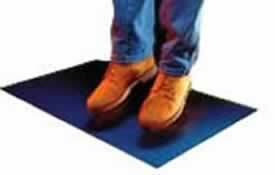 CushionStation mat is an anti-fatigue mat that offers bare-foot comfort! Starting at $54.71. Slip-resistant floor protection matting made from chemical-resistant 100%Nitrile rubber. Starting at $488.59. Rounded knobs on top and underside provides comfort. Ideal for checkout counters, machinery, etc. Starting at $53.72. 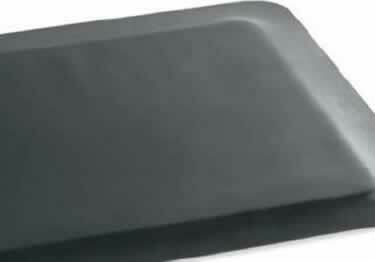 Wet or dry non-slip mat. 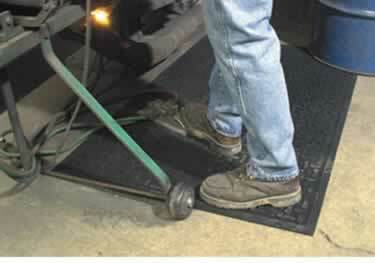 Anti-fatigue mat resists grease, oil, and chemicals. On sale now, 15% off regular price. Starting at $52.46.